Bu çalışma Dinleyici Yanıt Sistemine yönelik öğrenci görüşlerini ve bu sistemin öğrenci başarısına etkilerini ortaya çıkarmayı amaçlamaktadır. Bu çalışmanın örneklemini Erzurum Polis Okulundaki 139 öğrenci oluşturmaktadır. Çalışmadaki iki deney ve iki kontrol grubu rastgele seçim yöntemi kullanılarak belirlenmiştir. Deney ve kontrol grubunda yürütülen derslerdeki sınıf içi sorular, uygulamalar ve değerlendirme uygulamaları aynıdır. Dersler aynı öğretim elemanı tarafından yürütülmüştür. Dersin öğretim elemanı dersten önce eğitimde kullanılacak soruları hazırlamıştır. Kontrol grubunda ders içi sorular sözel olarak yanıtlanırken deney gurubunda dinleyici yanıt sistemi kullanılmıştır. Öğrencilerin dersteki başarılarını ve gelişimlerini ölçmek için bir yazılı sınav yapılmıştır. Dinleyici yanıt sistemine yönelik öğrenci görüşleri anket yardımıyla toplanmıştır. Sonuçlar 8 haftalık uygulamanın ardından dinleyici yanıt sisteminin kullanımının öğrenci gelişimi üzerinde anlamlı bir etkisinin olmadığını göstermiştir. This study aims to reveal the effects of using the Audience Response System on academic success and student perceptions of the audience response system. The sample of this study consists of 139ErzurumPoliceCollegestudents inTurkey. Two control and two treatment groups were assigned randomly. The course was designed to be the same for both treatment and control group with lectures, in-class questions, practices and exams. The instructor prepared multiple-choice questions before the lecture to ask in the classroom. While students in the control group responded the question verbally, the treatment group used ARS. One paper-based exam was used for the dependent measure of learning of concepts and skills taught in the lessons. Perceptions of students on ARS were collected via a questionnaire. Results showed that ARS usage does not have a significant effect on learner achievement after an 8-week period. Alexander, C. J., Crescini, W. M., Juskewitch, J. E., Lachman, N., & Pawlina, W. ( 2009) Asses- sing the integration of audience response system technology in teaching of anatomical scien- ces. Anatomical Sciences Education, 2 (4), pp. 160-166. Banks, D. A., & Monday, A. (2006) Audience response system in practice: Improving Hong Kong Student’s Understanding of Decision Support Systems. Proceedings of the 23rd Annual Asci- lite Conferance: Who’s learning? Whose technology? Ascilite 2006, The University of Sidney. Caldwell, J. E. (2007) Clickers in the large classroom: Current research and best-oractice tips, CBE-Life Sciences Education, 6 (1), pp. 9-20. Clark, R. E. (1994) Media will never influence learning, Educational Technology Research and Development, 42 (2), pp. 21-29. Doucet, M., Vrins, A., & Harvey, D. (2009) Effect of using an audience response system on learning environment, motivation and long-term retention, during case-discussions in a large group of undergraduate veterinary clinical pharmacology students. Medical Teacher, 31 (12), pp. 570-579. GaucI, S. A., Dantas, A. M., WIllIams, A. A., & Kemm, R. E. (2009) Promoting student-centered active learning in lectures with a personel response system. Advances in Physiology Educa- tion, 33 (1), pp. 60-71. Hall, R. H., CollIer, H. L., Thomas, M. L., & HIlgers, M. G. ( 2005) A student response systems for increasing engagement, motivation, and learning in high enrollment lectures, Procee- dings of the Eleventh Americas Conferance on Information Systems, Omaha, NE, USA. Jeff, C., & Evan, R. (2008) A primer on audience response systems: Current applications and future considerations. American Journal of Pharmaceutical Education, 72 (4), 77. Kay, R., & Knaack, L. (2009) Exploring the use of audience response systems in secondary school science classrooms. J Sci Educ Technol, 18 (5), pp. 382–392. Macdonald, R. H., Manduca, C. A., Mogk, D. W., & Tewksbury, B. J. (2005) Teaching methods in undergraduate geoscience courses: Results of the 2004 on the cutting edge survey of U.S. Faculty. Journal of Geoscience Education, 53 (3), pp. 237-252. Roschelle, J., Penuel, W. R., & Abrahamson, L. (2004) Classroom response and communication systems: Research review and theory. Paper presented at The Annual Meeting of the Ameri- can Educational Research Association, San Diego CA. Rubio, E. L., Bassignani, M. J., White, M. A., & Brant, W. E. (2008) Effect of an audience res- ponse system on resident learning and retention of lecture material. Am J Roentgenol, 190, pp. 319-322. Saunders, K. (2001) Teaching methods and assessment techniques for the undergraduate in- troductory finance course: A national survey. Journal of Applied Finance, 11 (1), pp. 110. WaIt, R. K., Could, B. A., Forster, L. A., Jones, T. M., Nokleby, J. J., Wolfe, C. R., & You- das, J. W. (2009) Use of an audience response system during peer teaching among physical therapy students in human gross anatomy: Perceptions of peer teachers and students. Anatomichal Sciences Education, 2 (6), pp. 286-293. Watts, M., & Becker, W. (2008) A little more than chalk and talk: Re- sults from a third national survey of teaching methods in undergradu- ate economics courses. Journal of Economic Education, 39(3), pp. 273-286. ISNAD YILDIRIM, Serkan , KARAMAN, Selçuk , ZENGİN, Selçuk . "Dinleyici Yanıt Sisteminin Öğrenci Gelişimine Etkileri: Erzurum Polis Okulu Örneği". 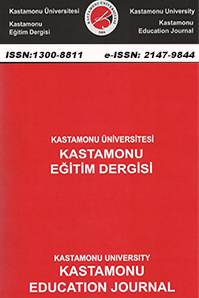 Kastamonu Eğitim Dergisi 23 / 2 (May 2015): 467-478.